After a torrid summer and a bashful rainy season, the much-awaited cool and breezy winter is finally here. And while it seems to be a blessing right now, in a few days the temperatures will drop further down, forcing us all to stay snuggled in our beds, sipping our daily cuppa. But, it doesn’t have to be like that. Today, we have easy access to a wide range of heating appliances from Lazer India, a reliable and quality-focused eCommerce portal for electronics, which are completely capable of keeping the room temperature at the higher end, thus making us feel at ease. 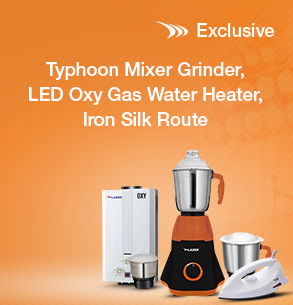 So, let us take a quick look at some of these winter appliances from Lazer. Heat Convecter: A simple yet efficient appliance, the Heat Convector instantly heats up the room and offers optimal temperature and heat control. Equipped with safety thermostat cutout, it is ideal for smaller spaces. Quartz Heater: When it comes to this portable heater which offers quick heating, Lazer India offers three different variants, namely, Heat Ways, Handy, and Equator. Compact in design, these electric heating appliances can be easily moved around as and when required. Halogen Heater: Arguably the best room heater in the market, the Halogen Heater features a wide angle oscillation thus ensuring even heating across the room. Its cool-touch body makes it rather convenient to be placed almost anywhere you like. Carbon Heater: Equipped with a carbon fibre heating element, this electric heater is perfect for moderate-sized spaces. Its aesthetically appealing design and high-temperature resistant body, makes this heater an ideal pick for modern day homes and office spaces. Oil Filled Radiator: This stunningly designed heater, offered in a combination of black and bronze by Lazer India is equipped with a PTC Heating Element along with an adjustable thermostat control. What makes this appliance even more appealing is the fact that it is facilitated with caster wheels for easy movement. Now isn’t that just the perfect blend of style, utility, and functionality? Now that you’re aware of some of the most compelling heating appliances out there, go ahead and take your pick. After all, why take the trouble of getting an expensive central heating system installed, when you could enjoy the same benefits for a much lower price and enhanced convenience!